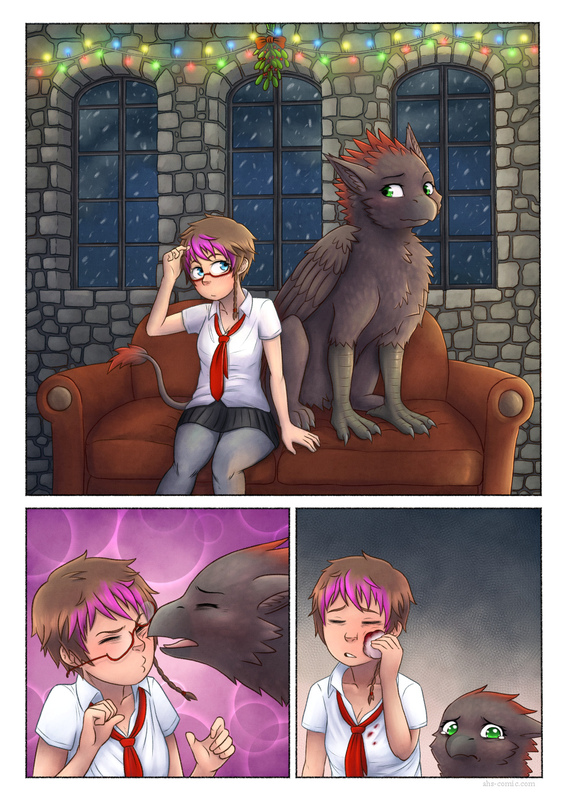 Here’s a comic about the dangers of kissing a gryphon. Just don’t do it kids. It’s best to leave this kind of stuff to trained professionals. At first I simply wanted to make an IFF version of this image. What can I say, I tend to get carried away. I wanted to have this done by new year’s eve, but you can see how that turned out. Getting sick certainly didn’t help matters either. And as much as I like this coloring style, it takes me way too long to do. I also run into the 4gb memory limit of my small system more often lately. I definitely have to figure out a more efficient way of doing things if I want to finish these comics within my lifetime. And now yet another thing I would have never even thought about if not for the internet. Ahahaha, that’s pretty funny. It’d be a cute wallpaper too (at least the top panel). Oh, dear. I’ve heard of a peck on the cheek, but this is taking it a bit too literally. Pff nah, you just need more memory. Though, perhaps wait til the price drops a bit. Apparently some Chinese memory factory burned down; they comprised around 25% of the market. >.> Seeing as the market is volatile, maybe pick out a RAM model you prefer, then set newegg to notify of deep price cuts. 20 bucks for a new memory stick would be sweet! Plus, you could resell at a profit or something. I’m using a tablet pc to draw with. Drawing directly on the screen is awesome, but the low memory and weak cpu is not. What kind of tablet PC is this? Cute! And also,ha. Given that Lisa used to be human, maybe she forgot that she now has a rather hard, rather sharp beak? Also, I love gryphons and I’d love to see more ‘o this! Have you ever read the Darklord of Derkholm? The main character has a a family of gryphons in addition to his two human children. I love both of your stories so far, please keep up the awesome work. Beaks are sharp and people are fragile. She should have done a more affectionate head rub instead. If i could i’d set up a kickstarter or something to help you but thats not for Europeans. Should get a team together and make an indiegogo to get the artist more ergonomic stuff and a better pc. Now that would be awesome.